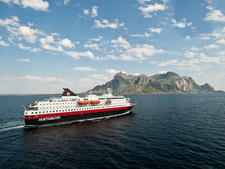 Forget cruising as you know it -- Hurtigruten's MS Nordnorge is more ferry than regular cruise ship. That being said, it's so much more than your average ferry. 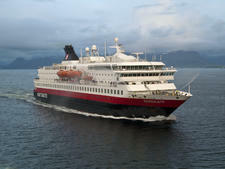 While the majority of passengers book expedition voyages of between four and eleven nights, there are plenty of Norwegians who use this sturdy ship as a day or overnight ferry service to travel between and to the more remote coastal communities in the north of the country. This makes for an interesting atmosphere onboard, but don't worry that it adversely affects the experience for those cruising -- the dedicated Expedition Team ensure that those discovering the Norwegian fjords and rugged Arctic are fully engaged in the itinerary. What's also unusual is that Nordnorge stops several times each day -- once for an extended stay, but more frequently for just fifteen minutes or half an hour. This is to allow passengers and cargo to offload, and guests who want to can dash round pint-sized fishing villages before hopping back onboard. 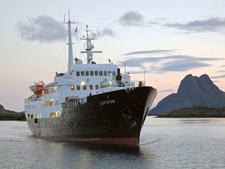 This 440-berth vessel was built in 1997, in the function-over-frills style that's expected of expedition ships. However, a major refurbishment in November 2016 has transformed much of the interior into a far more appealing place to spend time after a busy day hiking an icy mountain or kayaking the glassy waters of a fjord. Most of the ship's six passenger decks are now barely recognisable, although deck 2 and 3 cabins remain the same. 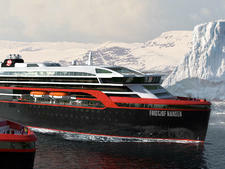 Hurtigruten describes the interior makeover as modern and Arctic-inspired, and everywhere is now smarter and brighter -- especially the staircases, which are illuminated by ingenious lamps that give the impression of natural sunlight streaming in. These make a real difference on short winter days in Norway. The playroom and library have gone. The main restaurant (renamed Torget) is much chicer than its predecessor, and the Explorer lounge on deck 7 now has a show-stopping fake fire which practically spans the width of the ship. Plus there's a brand new ice-cream bar and bakery (Multe). Who's for stockfish or brown cheese ice-cream? No joke, those two flavours really are available on Nordnorge. 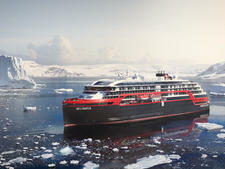 Another, more fundamental, change is that Nordnorge is one of six Hurtigruten ships to now always have a dedicated Expedition Team onboard (seven including MS Spitsbergen, which runs a limited programme). This group of experienced coastal experts deliver a programme of engaging lectures and special activities to really bring cruisers closer to the unique nature and culture of northern Norway. You'll find them in the conference rooms (behind the Kompass adventure reception on deck 4) or out on deck pointing out sights of interest -- a famous lighthouse perhaps, or a rock formation worshipped by the indigenous Sami tribe. The Expedition Team also lead the way off-ship, on a variety of hikes offered on every voyage. These expedition sailings have proved so popular that there are plans to roll out this initiative on all ships during 2018. Cabins on Nordnorge are on the snug side, but they're spotlessly clean with large dispensers of fragrant toiletries in the bathrooms. The limited space is largely a non-issue as most passengers are purely in their cabins to sleep, and there are plenty of comfortable places in the public areas to take in the breathtaking views. 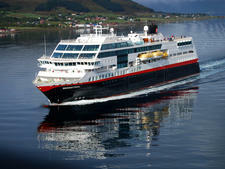 Norway has 1,250 miles of dramatic coastline, and its show-stopping fjords, islands and mountains can be seen from practically everywhere on this ship -- from the restaurants, the Explorer lounge and bar, the promenade deck and outdoor Explorer deck (which has a seated area with heated lamps, so you can stay outside to admire the scenery on colder days). You can even take up plum position in one of the two outdoor hot tubs for uninterrupted views from the back of the ship. Food onboard is exceptional, with buffets for breakfast and a mixture of buffets and set menus for lunches and dinners (waiter served). You can upgrade to an à la carte menu for a small additional charge. Be warned, the price of beer and wine will make your eyes water. It's not just that Norway is expensive (which it is), it's that the country has a strict health policy so prices are kept high on both booze and cigarettes to deter people from abusing them. Of course, that's no help when you fancy a large glass of red wine after a hike. And you're not allowed to bring alcohol onboard either. Excursions are also on the pricey side, but the expedition hiking pass is good value for keen hikers. Of course, you can mix and match by booking individual hikes and the odd excursion on the side. Or you don't have to book any of them. You can enjoy all the expedition lectures onboard for free and explore ports independently -- the ship stops 34 times on the classic route between Bergen and Kirkenes, so there's plenty to see along the way. Most cruises on Nordnorge begin or end in Bergen, the stunning "city of the seven mountains" which boasts a pretty UNESCO World Heritage harbour. Its museums, waterfront fish market and the composer Edward Grieg's house are all worth a visit. Plus there are excellent hiking opportunities here too, in the form of Mt. Floyen and Mt Ulrikken. If you have a few extra days to spare, a pre- or post-cruise stay in Bergen won't disappoint. Overall, if you're after a unique, adventurous cruising experience and enjoy being active in nature, then an expedition cruise on MS Nordnorge is the ideal choice. The organised hikes are especially impressive, and present a brilliant opportunity to explore the wilderness in a way that would be hard to do without the knowledgeable expedition team leading the way. The beautiful scenery along Norway's coastline will have you constantly clicking away on your camera, but living the experience in full 3D is the only way to really do it justice. Staff must be commended too. 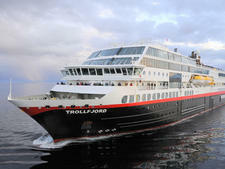 They really help make cruises on Nordnorge special. They're all incredibly well-informed, constantly smiling and extremely helpful. Their three weeks on/three weeks off roster clearly works wonders for staff morale and enthusiasm for the job. 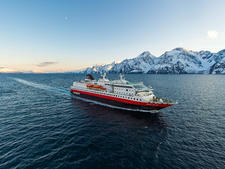 Passengers on Nordnorge aren't like to be active during the day and go to bed early at night. The average age is 55 plus, although this is skewed during the school holidays when there are plenty of families onboard too. There's no minimum age for the hikes, but most of them are classed as "level four" (requiring a good standard of fitness) and last between 1.5 and four hours, so they're probably not suited to the under 10s. The same goes for the lectures, which, though not designed for youngsters, might still be of interest to older children and teenagers. Typically, more than half the passengers are German, with the remainder hailing largely from Britain, the U.S., Sweden, Norway, France, Japan and the Philippines. 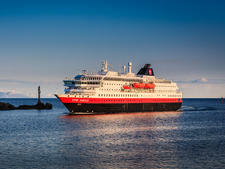 Norwegian and English are the official onboard languages, although German is widely spoken by staff members too. This is a relaxed, informal ship, with little or no dressing up, even for dinner. The key is to be comfortable for hiking and exploring, instead of worrying about appearances. Sturdy hiking footwear, sunglasses and waterproofs are essential whatever the season, but in winter bring thermals, lots of woollen layers, a warm jacket and possibly some hiking spikes for icy conditions. Summer is usually t-shirt weather, but again, think layers -- the onboard shop sells high quality knitwear, if you find you haven't packed enough. The weather can be changeable in Norway, and in Bergen it rains one out of every four days. 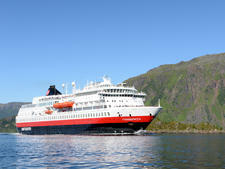 The basic fare includes breakfast, lunch and dinner, all taken in the main dining restaurant, Torget, on deck 4. It doesn't include any soft drinks (except for juice, tea and coffee at breakfast) or alcoholic beverages. Tap water isn't provided automatically, but if you request it the waiting staff will bring you a jug and keep refilling your glass. The tap water in cabins is drinkable too. The sauna, hot tubs, fitness room and expedition lectures are all free, but that's about it for inclusions. There's a small fee for Wi-Fi access and the self-service laundry (on deck 3). Drinks packages are available, but these are only worthwhile if you get through at least a bottle of wine a night. Hiking passes for a six-day voyage cost approx £142.50 (1500 NOK) per person, payable locally (there's a 25 per cent reduction for children). These include a minimum of four hikes during winter and spring, and six hikes during summer and autumn, and work out cheaper than buying individual hikes. 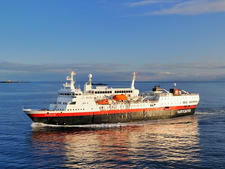 They can be purchased either in advance or onboard (subject to limited availability). 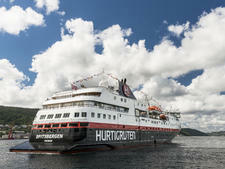 Excursions cost anything from £28 to £340, but the good news is that there are no automatic gratuities -- the staff on Hurtigruten ships are all well paid and don't expect it. There is, however, a tips pot at the entrance to the restaurant (should you want to thank waiting staff), and envelopes available if you wish to leave something for the cabin cleaners. 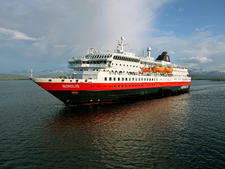 The currency used onboard is the Norwegian Krone but most major currency can be exchanged. Visa, American Express, MasterCard and Diners Card are all accepted onboard, and you can also get a cruise card to pay for extras and settle the bill at the end of the voyage. 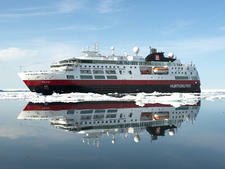 Hurtigruten also offers Select and Platinum fares which have additional benefits included. Select fare passengers are able to choose their cabin number (on voyages longer than seven days) and get complimentary Wi-Fi and tea and coffee. Platinum fare passengers also benefit from included á la carte dining, drinks package, a welcome basket and two exclusive shore excursions (from 1 April 2018).